Though the origins of Kubb are uncertain, I can attest that it is a fun game to play, either at your next back yard barbecue or at your next Renaissance fair. The pieces are fairly simple, so a set is relatively cheap and easy to make with the help of a few power tools. It can be made with only hand tools, it will just take longer and might make you break a sweat. First, a little history. 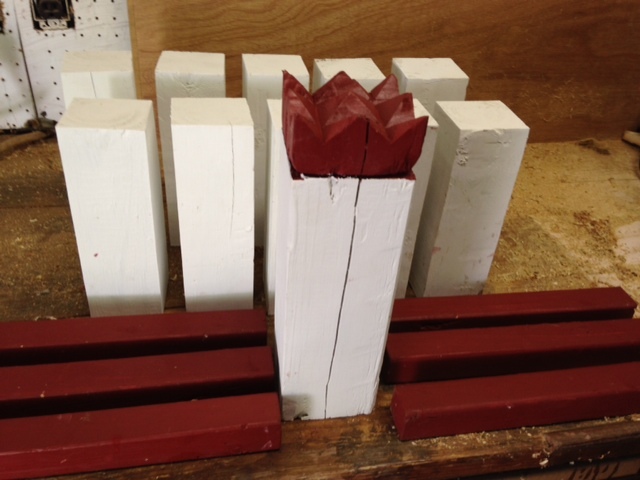 Kubb was popularized in the 1990s when a mass produced version appeared in Sweden. The accompanying rule book made a sensational claim of Viking Age origins and ancient play with the bones of slain enemies. I suspect the game was actually invented in the period of romantic nationalism, around the late 19th century, though it may have been inspired by some cryptic description of a much earlier game. The game involves ten kubbar (kubbs, if you like), one slightly larger king piece, and six batons. The kubbs are stood on end, five in a row, equally spaced across both ends of a long rectangular field. The king is stood in the very center of the field, and the batons are used for tossing at the kubbs in attempt to knock them down. Once toppled, a kubb is taken by the player who knocked it over and tossed back into play. Kubbs tossed back into play are then called “field kubbs” and played from where they land (stood up, of course). The kubbs remaining at the border of the field are called “baseline kubbs”. The objective is to first knock down all field kubbs, then all baseline kubbs, then the king. If a player knocks down the king while his/her team still has any kubbs in play, that player loses the game (like the eight ball in pool). TIP: I bought my lumber from Lowe’s “cull pile” so it was 70% off! It had some problem areas, but since I was cutting it into small pieces anyway I was able to work around those, so I saved a bundle on lumber. These can be made from one 8-ft 4×4 (which is actually 3-1/2 x 3-1/2 x 96 inches), one 6-ft or 8-ft 2×2 (which is actually 1-1/2 x 1-1/2 inches), and a 6-ft 3/4-inch dowel. The kubbs are cut to length and then ripped to 3″ x 3″ using either a band saw, a table saw, a radial arm saw, or by hand using a rip saw. If you do a messy job, just leave them a tad heavy and then use a block plane or power planer to shave them to 3″. I used a block plane on mine and it didn’t take long. You may wish to sand the ends. Next, cut the king piece to length and mark the end for cutting the crown. I cut mine to approximately 45-degree angles 3/4″ deep. Optionally, you may further decorate the king with bands by making shallow cuts on all sides. I made one cut just for the crown, which I painted a different color. The batons and stakes are the easiest to make. Simply cut them to length, and cut one end of each stake to a 45-degree angle. Next, paint or stain the pieces. The game strategy does not require any color contrast, but you can be as creative as you like. I chose to paint this set with red and white barn paint. I made another set once and stained them bright green and yellow using leather dyes, and sealed them with linseed oil. Now mow the lawn and you’re ready to invite your friends over to play!